I have been on a cauliflower kick lately. I’ve discovered that I really love this versatile, nutrient-dense veggie. So when I got 2 huge heads of cauliflower in my CSA box this week, I decided to experiment a bit. 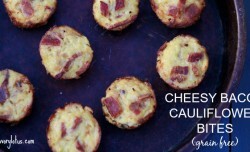 This is what I came up with: Cheesy Bacon Cauliflower Bites. Cauliflower has been on the menu quite often around here lately. My kids love it when I make Cauliflower Crust Pizza. Another favorite is Grain Free Pesto Flatbread. Did you happen to see my post last week on 32 Delicious Cauliflower Recipes? I have made several of them, and they are AMAZING! My favorite was the Sneaky Cheesy Garlic Bread from Beauty and the Foodie. Her recipes make me drool! That recipe actually inspired the one I am about to share with you all. 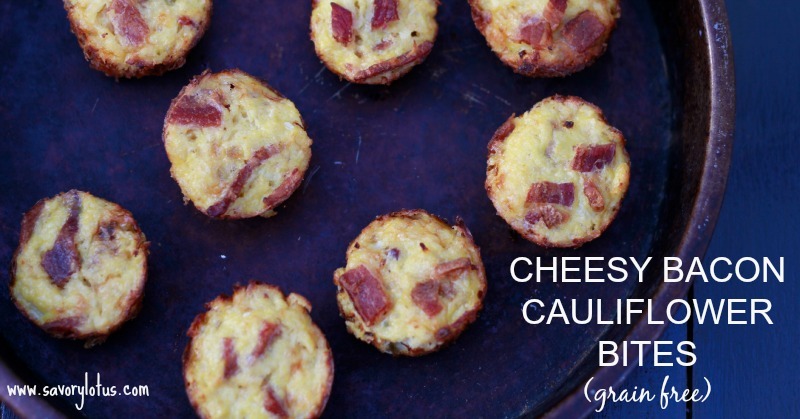 I make these cauliflower bites in my mini muffin pans . Be sure to liberally coat them with oil so they don’t stick. Allowing them to cool will make removing them easier. ENJOY! Preheat oven to 400’F. Liberally coated mini muffin pans (like this) with butter, ghee, or coconut oil. Place 2 cups of cauliflower “rice” into medium pot. Sprinkle with a pinch of salt and 2 TBS water. Cover and steam on medium heat for 8-10 minutes, until soft. Stir occasionally. Uncover, remove from heat, and allow to cool a bit. In a large bowl, combine eggs, cheese, coconut flour, salt, and garlic. Add the cooked cauliflower and mix to combine. Fill your mini muffin pans 3/4 full of the mixture. Press down with the back of a spoon to get it in there good. Bake for 20 minutes, until your mini cauliflower bites come out golden and delicious. Thank you Savory Lotus, the feeling is mutual. I love, love your recipes. This one is so good, I could lick the screen! Thanks, Stacey! 🙂 I’m embarrassed to say how many of these I ate when doing this post. Do you have the nutrition info for this recipe? Looks amazing! Oooh these look wonderful! I’ll have to try these soon. I’m totally on a cauliflower kick too. I finally tried making a cauliflower pizza crust and loved it. I bet these would be similar-ish and delicious! Great recipe! Would this work with another flour? I though I had coconut flour but it looks like I am out of it. Thanks. Just made these and they taste great – whole family loves them!!! The only downfall is the clean-up, even though I greased the mini muffin tin they still stuck. 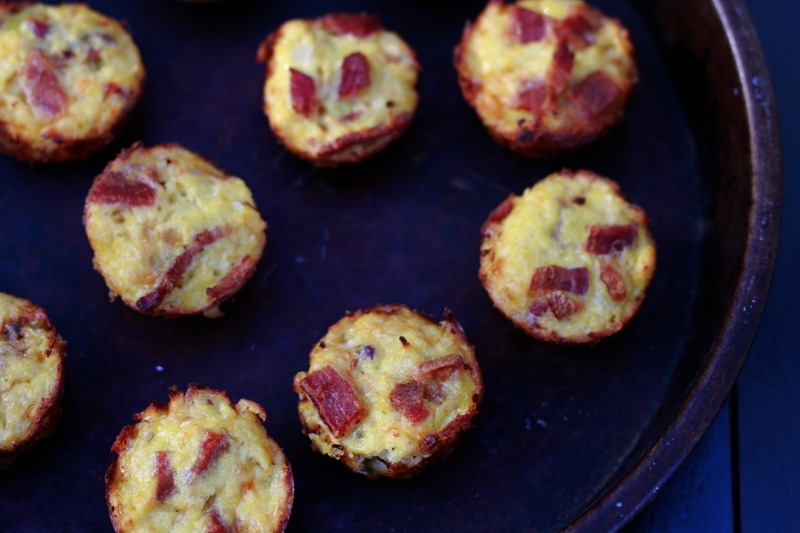 I’ve had this problem in the past with other egg muffins and now use silicon muffin liners – any suggestions as to time and temperature changes I could use to make them regular muffin size? good day Katja im glad i stumbled across this site as i am on the Paleo diet and have very little knowledge of what they mean about real food. Is there any advice you could give me about the Pale diet foods as it is difficult being from South Africa and there is very little known about this ? Hi, Patrick! 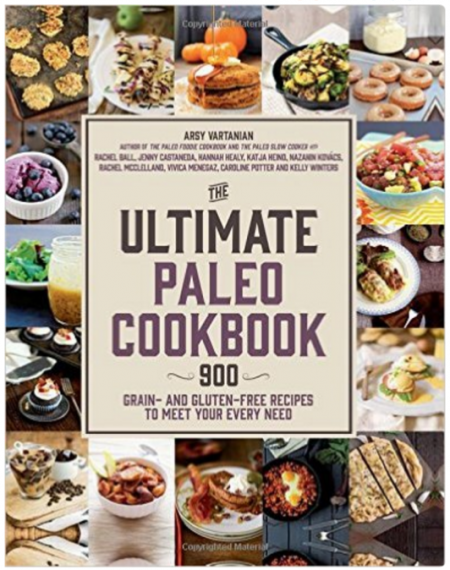 The Paleo diet id basically no grains, no legumes, and no dairy. It focuses on nutrient dense meats and veggies with LOTS of healthy fats. Read this for a detailed explanation—-> http://robbwolf.com/what-is-the-paleo-diet/ And please let me know if you have any specific questions. If you want to know more about what real food means, read this—> https://www.savorylotus.com/real-food-basics/ 🙂 Glad you found me! Thank you for the wonderful recipe! I doubled the recipe and baked at 350 in a pie plate. Worked great! What a great idea! Sounds great as a pie. 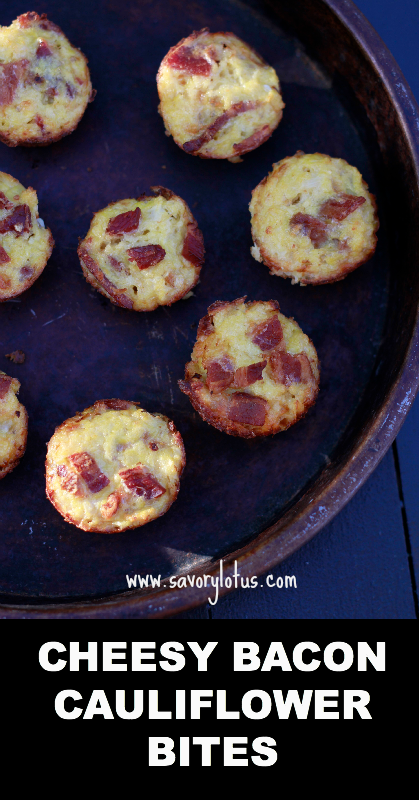 You can definitely taste the egg in these, sort of like a quiche! I wonder how these would come out cooked like a waffle in a waffle iron? So since these are egg-y, do they keep very well in the fridge? I’d love to try them out but I don’t know that my husband and I will eat them all in one sitting. I was thinking it could be a fun little snack to bring to work, actually! Have you refrigerated them? Do they keep well over several days (up to a week)? I have refrigerated mine for a couple of days. They have been eaten up after that. I would say 2-3 days in fridge for these little goodies is best. Milk, fream, butter, and cheese are all dairy. How is this dairy free? Hi! These are NOT dairy free. Did you read somewhere that they were? Do you thing they would freeze well? I’d love to add them to my freezer meals. Any chance I can get the nutrition content on these babies? Quite delicious, but, as I am starting my ketosis and counting calories, would be nice to know per serving amounts and nutrients. Thanks! Great appetizer! I didn’t have mini muffin tins and used a small casserole dish it came out perfect. 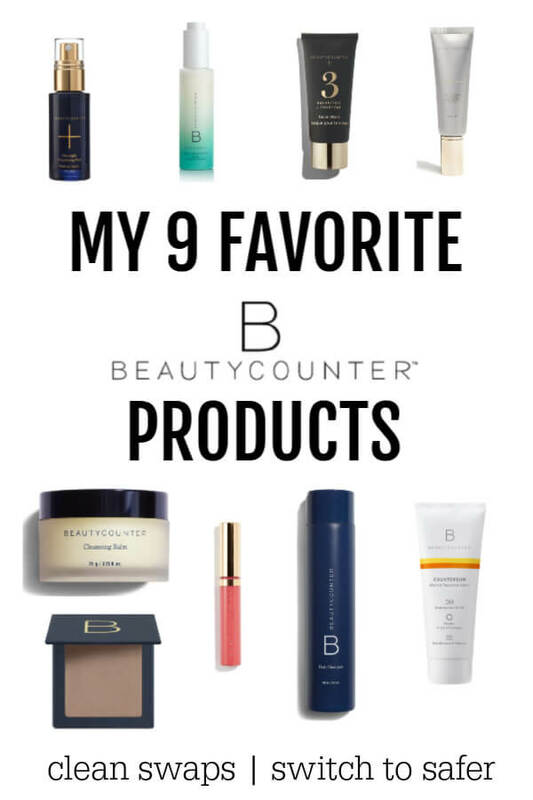 I am so happy that you liked them. My kids love these too. Thank you for your kind feedback.